Since ThePiano.SG started holding its weekly Pianovers Meetups in July 2016, the movement has grown tremendously. 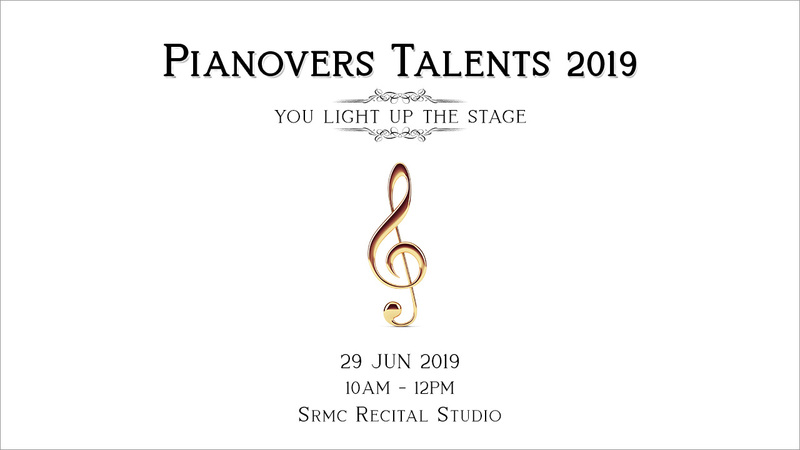 Every Sunday, without fail, Pianovers – our affectionate name for piano lovers – descend from all corners of the island onto Piano Park @ URA Centre, to bond, to network and to learn. 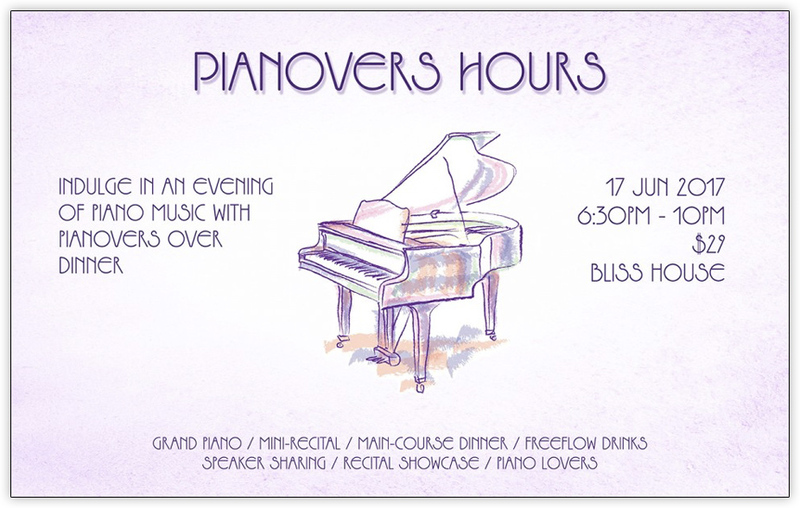 Pianovers Meetups, as the weekly gatherings are known as, are part of ThePiano.SG’s mission to bring together pianists, piano music lovers and just about anybody related to the piano. 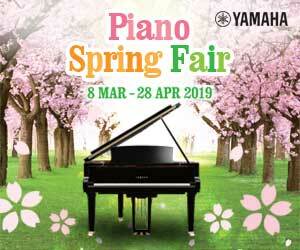 It was with great honour that ThePiano.SG was involved in the unveiling of two pianos at Tanjong Pagar Centre ("TPC"). This happened during a special meetup session, Pianovers Meetup #68, held on 4 February 2018, at this new mixed office-and-retail development in the heart of Singapore’s financial district. The two pianos had been placed here in collaboration with Play It Forward Singapore, as part of current Season 7. Now, office workers, diners and even passers-by have the opportunity to try their hands on the two beautiful, refurbished pianos! To mark the occasion, Tanjong Pagar Centre even gave out $50 shopping vouchers to the first 50 people who attended Meetup #68. On the day of Meetup #68, TPC conducted an interview with Sng Yong Meng, the Founder of ThePiano.SG, on his vision for ThePiano.SG and what the organisation has achieved. We are delighted that the interview has appeared in the Tanjong Pagar Centre’s online magazine, Stories By TPC, titled Music In The Key Of C.
At ThePiano.SG, we are a very close-knit family. We encourage everybody to step up during the weekly sessions and show what they are passionate about playing. No matter how experienced they are or what level of their learning journey they are at, we applaud them and recognise them for who they are. It was precisely this sense of camaraderie that encouraged this member to soldier on, despite the negative feedback she had received. ThePiano.SG, however, is not just about getting together and playing the piano. It is also about bringing the piano to the less fortunate members of society. ThePiano.SG runs a programme known as Pianovers Assist. Under this social initiative, we collect pre-loved pianos in working condition and loan them free to pre-qualified Pianovers for six months, regardless of their financial background, so that they can benefit from the best opportunities in piano education; before passing them on to the next beneficiary on the list. We aim to let deserving, passionate pianists have a piano with which to pursue their passion and hone their skills. This is our way of giving back to society and allowing the community to benefit. ThePiano.SG is also immensely proud that we have been featured in various media. In August 2017, Pianovers Meetup was featured in the Challenge magazine, the publication of the Public Service Division under the Prime Minister’s Office. 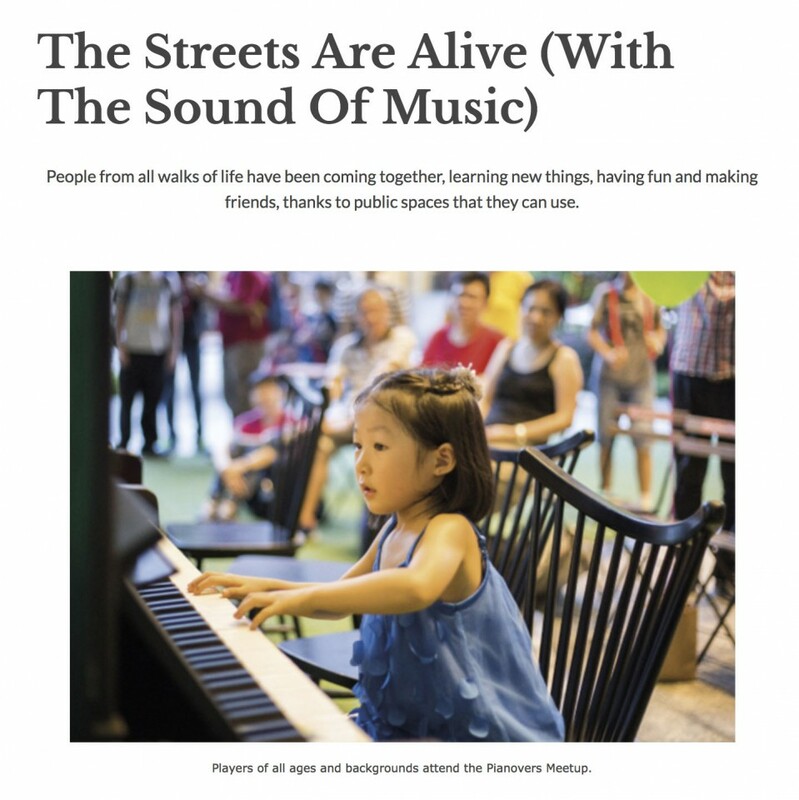 The article, entitled "The Streets Are Alive (With The Sound Of Music)", described the weekly Pianovers Meetup and how they have helped to foster a community of piano lovers. 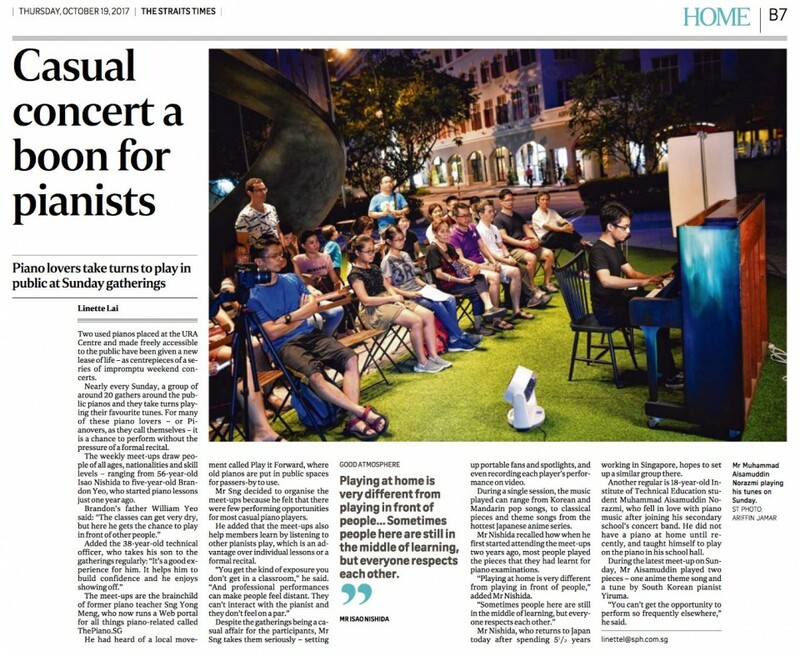 Two months after that, Singapore’s national daily, The Straits Times, also ran a feature about Pianovers Meetup, in an article called "Casual concert a boon for pianists". 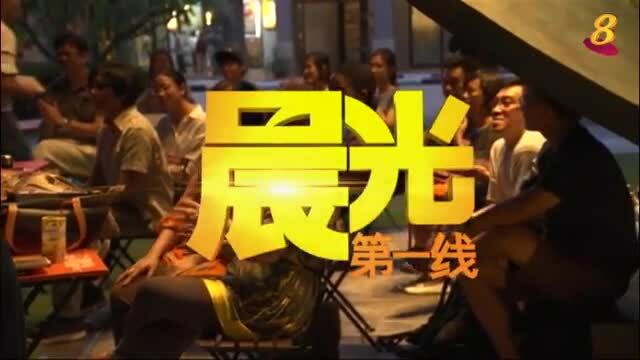 ThePiano.SG has also been featured on television. Apart from appearing on Channel NewsAsia’s 10pm news on 12 September 2016, we were mentioned in Channel 8’s programme, 晨心诚意, on 25 October 2016. While we are elated that we have been featured, we are even more excited that these are testament to our efforts and an affirmation that we have been doing the right thing. Going forward, we aim to do even more to engage the piano community. As part of our continuous efforts to reach out to the community, we shared our passion for piano music with a local school. In July 2017, we visited Zhonghua Primary School, and shared with its students, teachers and principal, about how we connect piano lovers in our community. More importantly, we talked about we could help sustain their interest in the piano, build their passion for the instrument and even establish a piano culture in the school, all through using the Pianovers Meetup platform. This visit was conducted in conjunction with the school’s Arts Festival. Recently, we also kicked off a new initiative known as Pianovers Connect. Under Pianovers Connect, we provide opportunities for Pianovers to perform in events or gigs, or even conduct activities, workshops or courses, for a wider audience. The idea is to allow Pianovers an avenue in which to connect with society. Once in a while, ThePiano.SG conducts special events to make things interesting for Pianovers. Last year, we conducted Pianovers Hours, a dinner programme held in a restaurant hosting a white piano, that saw Pianovers enjoy music while having a great dinner. 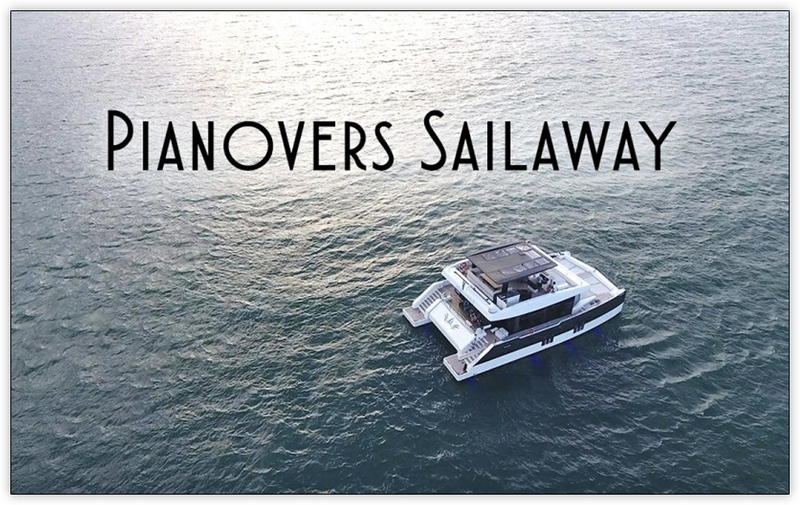 The year before, we held what was Singapore’s first piano-themed yacht event, complete with four pianos on board, in an event called Pianovers Sailaway. Pianovers sailed out to the open sea, enjoyed a buffet dinner and watched fireworks over Sentosa. The event is poised to set sail again in 2018, as we are planning for the next Pianovers Sailaway! 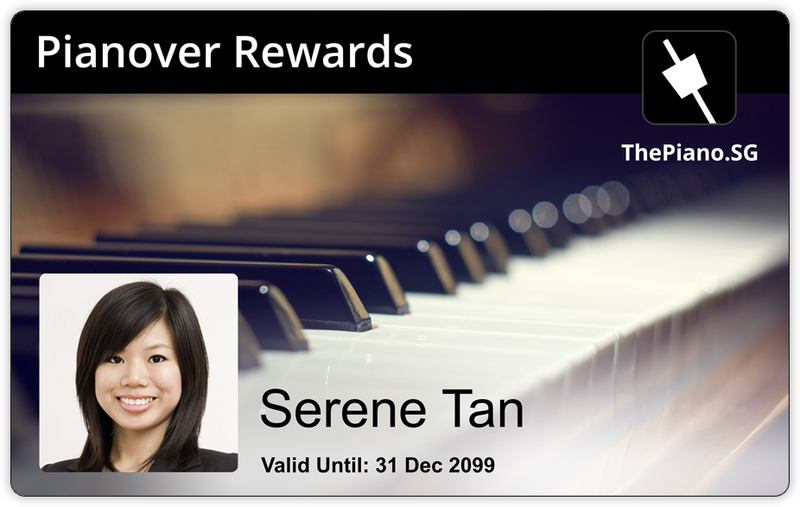 We have also launched our Pianovers Rewards programme. It comes with a card that allows you to obtain discounts when you purchase products and services from our partner merchants! It also allows you to obtain a 10% discount when you purchase items from our recently-opened Online Store, an online depository of piano-themed items, ranging from accessories to stationery! If you are a music lover and are not yet a part of our community, join us today! We meet every Sunday at 5pm at The URA Centre. Be part of our mailing list. Join us on our Facebook Page and follow our Instagram account!